England regained the Ashes with a momentous 197-run win in the deciding Test to seal a 2-1 series triumph. 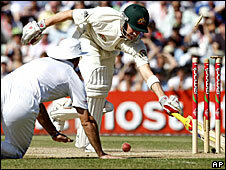 After losing 5-0 in Australia in 2007, victory in The Oval sun was reminiscent of England's famous 2005 Ashes win. Australia resumed on 80-0 needing a further 466 for a world record win but twice lost two wickets in two overs. Andrew Flintoff, in his final Test, brilliantly ran out Ricky Ponting (66) and Mike Hussey was last out at 1749 BST on day four after a defiant 121. Some said this series did not match the tension of 2005 but the continual fluctuations made it highly absorbing. After their final wicket pair held on against the odds for a draw in the first Test, England took a 1-0 lead with their first Test win at Lord's for 75 years. They were denied by the weather and a fine Australian rearguard at Edgbaston before capitulating to emphatic defeat at Headingley, and unlike in 2005 the series came to the final match with either side able to win outright. The target of 546 had never been achieved in any first-class match, and only once had a team scored more than 500 batting last in a Test. Australia still harboured hopes of making history but only 15 minutes into day four, Simon Katich made a fatal error of judgement as he offered no stroke to a quicker arm-ball from Graeme Swann. Expecting the ball would turn away, it instead thudded into the pad and he was plumb lbw. The old adage of one wicket bringing two was quickly demonstrated again when Shane Watson departed four balls later, pinned on the back foot by the persistent Stuart Broad. Watson appeared disgruntled and waved his bat, but replays showed he had little grounds for complaint as any contact with the bat was made after the ball struck his pad. Ponting was given a standing ovation as he made his way to the crease, while Hussey was fidgety and struggling for confidence given the dip in his average from nearly 80 two years ago to under 30 during the last calendar year prior to this game. With Broad attempting to grip the ball on the surface and utilise any uneven bounce by bowling a lot of slower balls, old fashioned fields were set. There was often only one slip for the seamer as men were instead stationed in front of the bat. 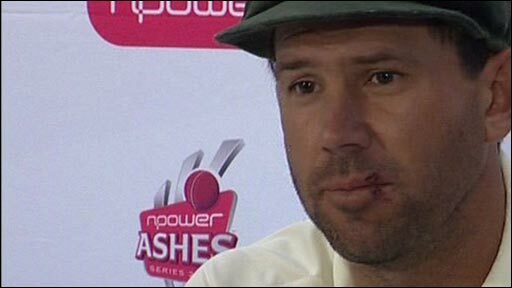 Ponting's customary fluency was slightly affected by the unpredictable pace of the pitch but, as expected, he soon got into his stride and looked in complete control in partnership with the battling Hussey. Unusually for such an accomplished fielder, Paul Collingwood was guilty of three dropped catches standing close at slip, and Swann was the unfortunate bowler on each occasion. Hussey was put down on 21 and Ponting when 51, both of which were devilishly tough chances as the ball dipped low, but Hussey should have been taken at a more regulation height when he edged the probing Swann again on 55. 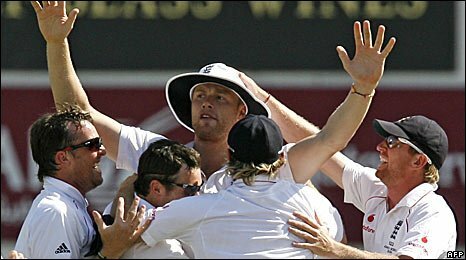 With the batsmen set it needed a moment of magic, and fittingly it came from Flintoff. Hussey thought the big man was labouring in the field when he called for a run, and he was right, but he forgot that Flintoff's throw was still as strong as ever and Ponting was out by six inches as a stump came cartwheeling out of the ground. Astonishingly there was another run-out five balls later and this time it was down to captain Andrew Strauss. Michael Clarke's clip off his toes ricocheted off Alastair Cook's ankles at short-leg, but Strauss reacted quickly, as did Matt Prior - the wicketkeeper got himself out of the way and allowed his skipper to underarm the ball into the stumps. After numerous replays, third umpire Peter Hartley ruled that Clarke's bat had not got over the line when the bail was dislodged. Swann got a deserved second wicket courtesy of more alertness from Prior, who collected a steepling ball expertly at head height but was still able to take off the bails with Marcus North unable to edge his foot back into his crease. Umpire Billy Bowden was confident enough to give the batsman out without the need for the third official's involvement, and England were five wickets from victory with more than 30 overs left in the day. Hussey, who had gone 28 innings without a Test century, proved his powers of resolve had not deserted him and ground out a defiant 10th hundred. Brad Haddin was determined to play his shots throughout, even after being dropped at mid-wicket by substitute Graham Onions, but having scraped his way to 34 he swiped at Swann and was comfortably caught by Strauss in the deep. Steve Harmison then came to the fore with three wickets, with Collingwood atoning by diving sharply to his left at second slip to snare Mitchell Johnson's edge. Peter Siddle spooned to Flintoff at mid-off and next ball Stuart Clark fended to short-leg for a duck. There was to be no hat-trick but the scenes that followed after Swann had Hussey caught at short-leg were as memorable as any cricketing moment.